Winter is on its way to Reno and at Michael Hohl Subaru we want to help you be ready with a set of New Winter Tires for your Subaru. We encourage all Subaru drivers in Reno, Lake Tahoe, Sparks, Gardnerville, and Carson City, Nevada to visit with our friendly and knowledgeable Parts Specialists to learn about all the great options we have in our inventory for new winter tires. Our top priority is to help our customers find the new winter tires that will work best with their particular Subaru model, as well as your everyday driving conditions. We carry some of the top brands of winter tires, including Bridgestone Blizzak and Firestone Winterforce. We encourage you to fill out the form on this page to contact our Parts Department for details and pricing on your set of four new winter tires for your Subaru. We look forward to seeing you at Michael Hohl Subaru today and helping you choose your new winter tires. Here at Michael Hohl Subaru we are proud to provide our customers with competitive pricing on new snow tires for their Subaru, including Bridgestone Blizzak and Firestone Winterforce. When you equip your Subaru with a set of new tires for winter you will have the added peace of mind that when driving in inclement weather, including ice and snow, your Subaru will stay on its intended path. Our Parts Specialists are courteous and knowledgeable and they are happy to help you pick out just the right snow tires for your Subaru. 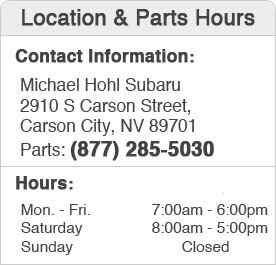 We invite anyone looking for new winter Subaru tires in Reno, Lake Tahoe, Sparks, Gardnerville, and Carson City, Nevada to visit the Retail Parts Department at Michael Hohl Subaru. We are located at 2910 S Carson St., Carson City, NV 89701. Or give us a call at (877) 285-5030.